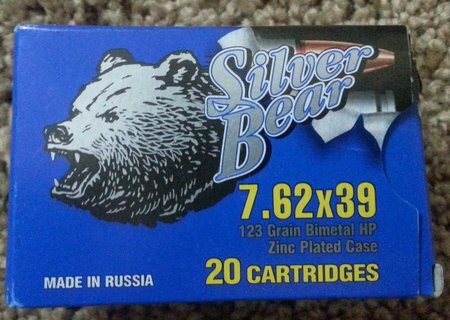 Silver Bear 7.62×39 ammo is manufactured by Barnaul Cartridge Plant JSC located in Russia. The Barnaul Cartridge Plant is a huge facility and produces millions of rounds of ammunition. It is one of the largest ammunition plants in the world. Silver Bear 7.62×39 ammunition is military grade, steel cased and affordable. The bullets are lead core, low carbon steel jackets with copper plating. The steel (low carbon) jackets are soft or annealed to prevent damage to rifle barrels. The steel jackets are much softer than a rifle barrel. The copper plating prevents corrosion and adds lubricity to the bullets. Silver Bear ammunition features steel cases that are Zinc plated. The Zinc plating prevents corrosion of the steel case. 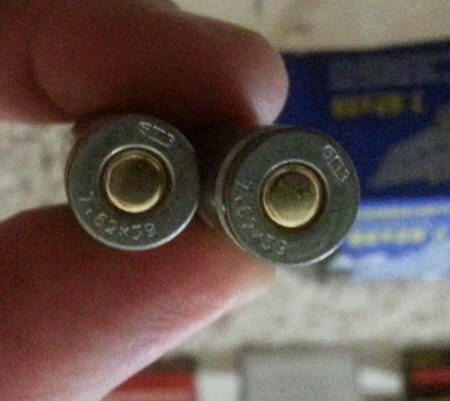 It also makes the cases feed reliably and also helps with easy extraction after the cartridge is fired. 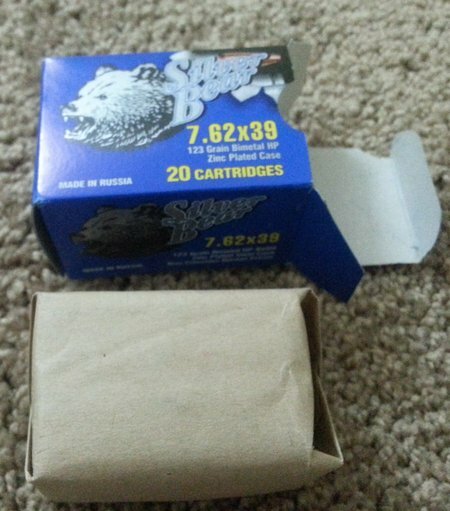 20 rounds or 1 box of Silver Bear 7.62×39 ammo. Cases are perfect with no dents, dings, corrosion or scratches. Quality looks very high. 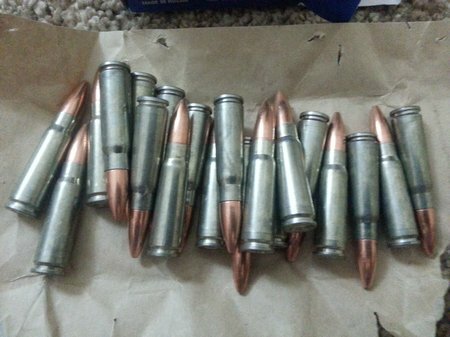 Notice silver cases with copper colored bullets. 20 rounds are packaged in brown paper and stapled on each end. The paper helps to keep moisture away from ammo. Primers are non-corrosive as is the powder. The primers are berdan style. Bernaul manufactured steel cases with zinc plating. 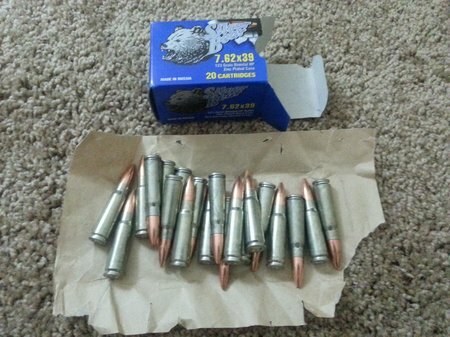 Russian steel cased ammunition is very inexpensive…around $0.23/round. 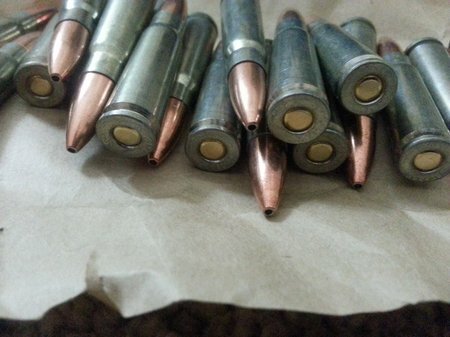 It is great practice ammo or for combat type situations (SHTF). It will not damage your gun like some people think. The low carbon steel bullet jackets may wear a rifle barrel faster than copper but it will take a long time…around 6,000 rounds of rapid fire and minimal cleaning. If you don’t let the barrel get too hot (700 degrees) and you clean/lubricate your barrel often, you could go 10,000 rounds before wearing the barrel out. The cost savings of steel cased Russian/Ukraine ammo over copper jacked ammo is substantial…more than enough to buy a new barrel or even a new gun. 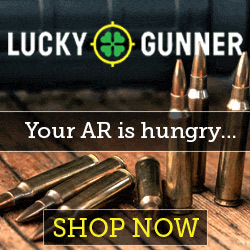 The savings over 6,000 rounds is something like $1,300.00. I can easily have a new barrel put in my AK-47 for that and actually I can buy a whole new AK-47 for less.